The hoax was apparently sparked by a disagreement over a ‘Call of Duty’ game. 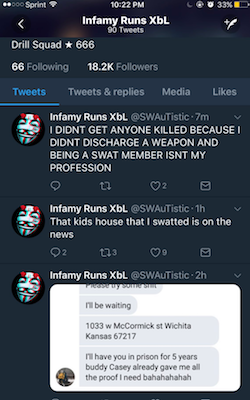 Update: The Wichita Police department has confirmed this is an incident of SWATting, and released material including audio of the phone call that sent officers to Finch's door and video of what happened when officers arrived. According to the police, their investigation is ongoing, however, they noted that the caller continued to contact 911 even after the police had arrived on the scene. Update 2: Los Angeles police have arrested 25-year-old Tyler Barriss on a warrant from Wichita for making the hoax phone call.